“We just have to put our heads down, work hard, play our best and take one game at a time. Then we’ll look up at the end of the year and see where we’ve landed,” says every college football coach at one time or another, usually during an early- or mid-season interview. As an avid fan of two teams, I took that sentiment to heart this year. I overcame my sports hangover after an early loss by each of my teams, pulled myself together and thoroughly enjoyed the remainder of their regular season games, conference championships and playoff semifinals. I looked up on the evening of New Year’s Day 2015 to find both my teams, and myself, Arlington-bound for the inaugural CFP National Championship Game. The story of my sports fandom is a bit nontraditional. It probably sounds far-fetched that a girl who was born in Atlanta, grew up and attended two colleges in Indianapolis, has never lived in Ohio, married an SEC fan, recently moved to Montana and has yet to set foot in the state of Oregon owes any allegiance to the Ohio State Buckeyes or the Oregon Ducks. Don’t write me off as a bandwagon fan yet; I can explain! 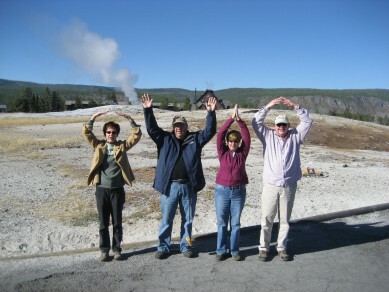 My parents and friends representing O-H-I-O at Yellowstone. I was introduced to Ohio State football at a young age by two people who met on campus in Columbus: my parents. Although I’m not a Buckeye by birth, I’m definitely a Buckeye by blood and probably owe my existence to OSU. But I’m more analytical than sentimental, so here’s why I embraced the Buckeyes and never looked back. Over the years, I have become an “understand the landscape” kind of fan — probably because I could never quite get on board with any of my hometown teams (sorry, Indianapolis Colts). My favorite thing about football is watching players develop, from the day I read their names on National Signing Day through the end of their careers, whether collegiate or professional. I’ll watch (mostly) any team on any day. 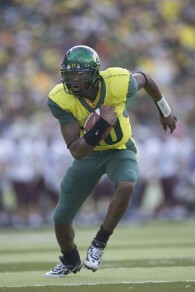 I have never been a player, coach, recruiter or scout — but when I stumbled upon Dennis Dixon and the Ducks in 2005, my freshman year of college, it truly opened my eyes to how exciting offenses could be. I had always been more intrigued by defenses — my favorite players were James Laurinaitis and AJ Hawk — so Oregon blew me away. But that was just my first impression, and it wasn’t just the QB play that piqued my interest. Oregon was a fun and talented team all-around and the Ducks, unlike the Buckeyes under Jim Tressel, seemingly had no reservations running up the score on opponents when the opportunity presented itself. It became kind of a guilty pleasure to watch my conservatively-played OSU game Saturday afternoon and then tune into Oregon’s faster-paced, higher-scoring game Saturday evening when I could get it in Indy (east coast bias in broadcasting, you know). I’ve enjoyed having a second team to follow for a decade. Initially, I didn’t have the emotional attachment to Oregon that I did to Ohio State, so when the Ducks won it was fun and when the Ducks lost it didn’t ruin my entire week. It only became a conflict of interest in one Rose Bowl. Win-win… until 2011, anyway, when OSU didn’t do much winning. Most readers are probably familiar with OSU’s NCAA violations, uncharacteristically awful season and premature coaching and player changes as a result of Tattoo-Gate (I miss you, Terrelle!). For me, 2011 was a year to forget. 2012, however, was a turning point. I came home from Ohio State’s 2012 Spring Game guessing, as a fan standing on the outside looking in, that new head coach Urban Meyer had a lot of work to do in the season ahead. Months later, I watched the Buckeyes’ opening game against Miami (OH), and would never have believed it was the beginning of a 37-3 run. But, when I sat down that evening and watched redshirt freshman Marcus Mariota‘s collegiate debut against Arkansas State, I knew I was watching something special. September 1, 2012 was the first day of the best three years of my life as a college football fan, and I resolved to narrow my focus on Ohio State and Oregon so I could soak up every snap. And that’s what I did! Along the way, I also took this Oregon thing to the next level when I found and joined FishDuck.com as an editor (note: thanks, all, for putting up with me!). 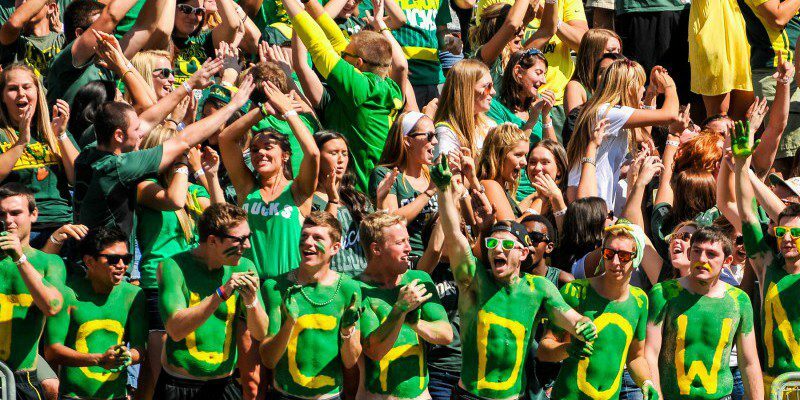 The experience has only made me love and embrace the culture around Oregon’s program even more. I am proud to be a Buckeye by blood and a Duck by choice. Friends have asked, “What are you going to do now that your two worlds are colliding?” The answer is simple: claim media neutrality and avoid the question! I will continue to enjoy every second of this amazing season, write a killer article from the Ohio State post-game press conference on behalf of FishDuck.com (coming Tuesday) and walk away as one of the proudest fans in college football after one of my teams becomes the first-ever winner of the CFP National Championship. Pinch me; I think I’m dreaming. Go Team(s)! Note to self: no more shopping.